Martha Crone begins her 24th year as Garden Curator and the Garden enters its 50th year. 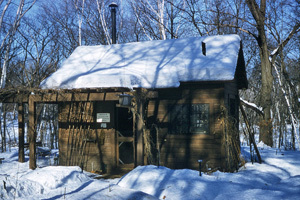 The Garden Office in Feb. 1956, photo by Martha Crone. Click on image for larger copy. “November ushered in the winter rather hurriedly this year, even before the close of October, the ground was covered with a blanket of snow. Now this change is a preparation for winter-life and there need be no bleak or desolate aspect. Ostrich Fern (Matteuccia struthiopteris), Photo ©G D Bebeau. “The making of such a garden will be a most delightful experience. An intensive program has been planned to establish many varieties of ferns, including some of the more elusive ones, which so often grow where no eyes can see them. The area consists of a gentle slope and some low land, being splendidly adapted to accommodate many varieties of ferns. There will be ferns for shade and sun. for dry soil and moist locations. Evergreen wood ferns and Christmas fern. 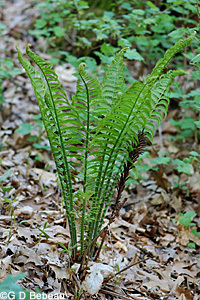 The large graceful Ostrich fern (photo) sometimes called Palm of the North, the dainty maidenhair and a score of others. The Friends held their annual meeting on Tuesday Jan. 3, 1956 at the offices of the Burma Vita Company at 2318 Chestnut Ave. West, in Minneapolis. 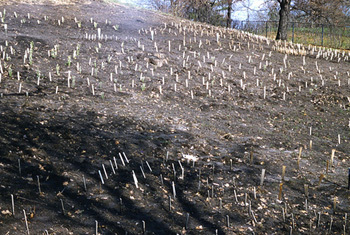 The new Fern Glen after some planting, photographed on May 14, 1956 by Martha Crone. Winter was not finished - On the 7th there was snow and cold with blizzards in the Northwest part of Minnesota but only a light snow in the Garden. On the 11th she noted Snow trilliums and Hepaticas in bloom and the new fern hill had been “disked and finished”, meaning the ground was cleared and ready for planting. 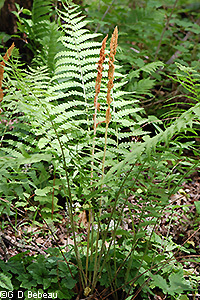 Cinnamon Fern (Osmundastrum cinnamomeum), Photo ©G D Bebeau. Sarracenia minor, Hooded Pitcher Plant, not native, from Meyers Nursery via a source in Alabama. Spring was very cool until May 9th when the temperature reached 72 degrees, the warmest since the past October. She could open the windows of the office. On May 16 the Hummingbirds arrived back at the Garden - this was a date she usually tracked. By this time she had planted 1,537 ferns in the new Fern Glen. Viola pubescens var. eriocarpa, Smooth Yellow Violet, not native, from Johnson’s Nursery, Mass. 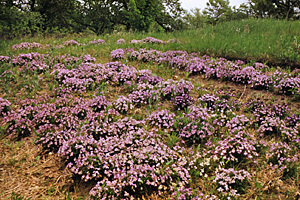 The large bed of Bird's-foot violet (Viola pedata) in bloom in the Upland Garden, photographed on June 2, 1950 by Martha Crone. Click on image for a larger version. 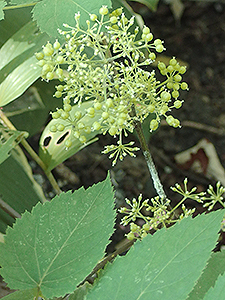 The Summer planting was devoted mostly to putting in numerous plants of species already present in the Garden. 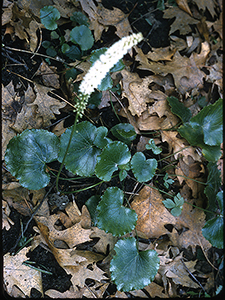 Galax (Galax aphylla) in bloom; photographed on June 28, 1956 by Martha Crone. Click on image for a larger version. “The late blooming plants seem to have saved up a great deal of surplus vitality for the grande finale, as tho to compensate for the bleak season ahead. The now shaded slopes where the sun rested in early spring before the trees leafed out and in sheltered glens where bloomed Hepaticas, Trilliums, Trout Lilies, Violets, Azaleas, Rhododendrons and countless others, now are taken over by dense colonies of White Wood Aster, Blue Wood Aster, Arrow-leaved Aster, Crooked-stemmed Aster, Zig-zag Goldenrod and Wreath Goldenrod, since they are all shade loving plants. Many others of the Composite Family - the most prodigious family in the floral world are in evidence. Follow the winding trail thru the moist meadow and where Lady's-slippers bloomed earlier, and the Blue Bottle Gentian, Cardinal Flower, Blue Lobelia, and Red Turtlehead predominate. Many of the spring plants are now dormant and no trace of them can be found. The red, gold and maroon of the various trees adds the brilliant hues which asters lack. The Bittersweet vine on the border fence is covered with beautiful clusters of orange berries, which finally split open to display the brilliant red globes within. Bird's-foot Violet bicolor (Viola pedata) noted in Martha Crones text. Photo ©Corey Raimond, University of Wisconsin, Wisconsin Flora. In her annual Secretary’s report (2) Martha Crone stated that 4,509 new plants were set out. By the time she wrote this report at the end of the year, she had set in 2,161 ferns (included in the 4,509 total above). Of the $775 gift from the Minnetonka Garden Club and Little Minnetonka Garden Flower Club, she still had $251 to spend on more ferns. She believed there would be Winter loss on the new plants due to lack of snow so far. 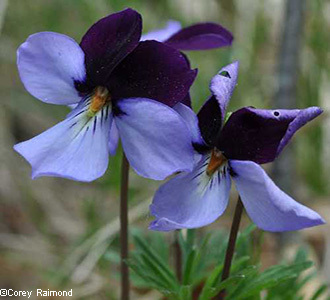 On Nov. 14, Martha noted that the Bird’s-foot Violet bicolor (Viola pedata bicolor type) was still in bloom. (1) That was her last log entry of the year. Once again, Martha was honored by the Minnesota Horticultural Society where, at their 90th Annual Meeting, she received the Bronze Medal for achievement in horticulture. She had received an award of merit in 1954. (3). Annual Reports of the Garden Curator to the Board of Park Commissioners. Photo top of page: The hillside of Interrupted Fern on June 9, 1953. This was the site of Eloise Butler’s ‘fernery’ and still exists today. Photo by Martha Crone. Martha Crone's Annual Report to the Board of Park Commissioners dated Feb, 15, 1957 to Superintendent Charles E. Doell. Vol. 4, # 1, January 1956, Martha Crone, Editor. Vol. 4, # 2, April 1956, Martha Crone, Editor. Vol. 4, # 3, July 1956, Martha Crone, Editor. Vol. 4, # 4, October 1956, Martha Crone, Editor.